​Working on your first set up, be it in a new cage, or deciding to do something a bit different, can be daunting. You’re faced with a big empty space that you’ve somehow got to make the most of. The first thing to say on this is don’t immediately think you’re going to get it right first time. It takes time to learn how best to set up a new space, be that a cage or a hutch for example. However approach it in the right way and you can get a lot closer first time. Here’s my approach to setting up a cage each time. 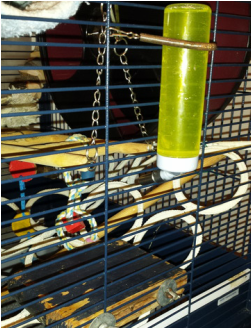 1, Key items – there are a few items in each cage set up which are either a pain to move around, or large and cumbersome so can only go in a few places. 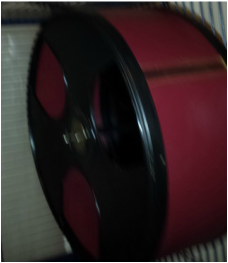 For me these are usually the wheel (or wheels, I have been known to have 2 in a cage) and digging box if I’m using one, sometimes I might add a set of mini drawers or a large hanging bed. Other than the wheel these don’t always go in and I try to stick to only 2 or 3 large items. When they do they become the first things that go in. I try and vary the location a bit from the obvious, my wheel often goes near the top (as this is where they spend a lot of their time), or by where they wait to be fed or got out (my rats are fans of “why are we waiting” running), a digging box often gets hung unless it contains very heavy soil, to maximise floor space in the cage. 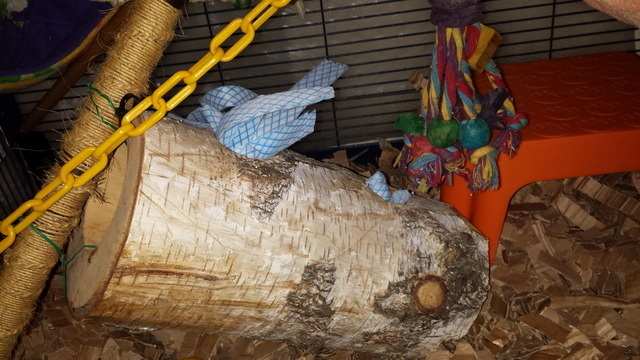 My largest branch or rope then goes in to add a bit of structure to hang other things off (I have an SRS which is lacking in places to attach things to on the front of the cage). 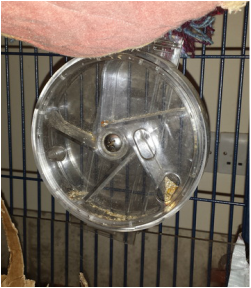 2, Large Platforms – I use hanging litter trays rather than shelves (adapted cat litter trays with key ring clips, hanging corner litter trays or just converted plastic boxes) as these are a lot better at keeping the smell down and extend the foraging area much more. For a large SRS I aim for roughly 2 platforms as these gives me plenty of space to fill the rest with things to do, rather than just sit on. I aim for one about middle of the cage, and one at the bottom. 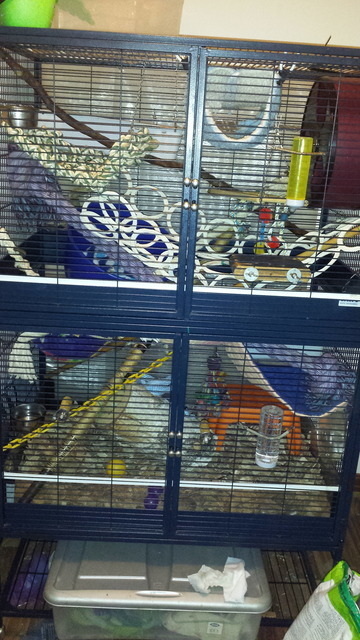 For a cage under about 90cm tall I would only use 1 platform as otherwise you fill the space too much. 5, Hanging toys – I then add a few interesting objects and toys, there are typically hanging food baskets, parrot foraging toys and interesting balancing toys, I spread these around the cage in harder to reach areas. 6, Connections – I go over and connect up all the spaces using ropes, smaller branches and perches. These are usually the more challenging balancing and climbing toys I have, so can be a little wobbly or narrow, or very vertical. Once finished there is a fair network of ropes, perches and branches but with enough space for them to jump around as a quicker method too. 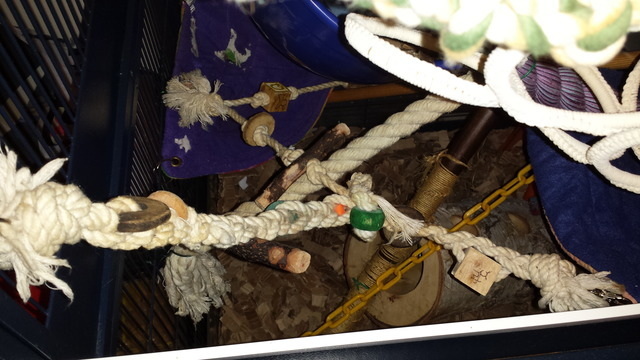 Usually at this point I spot a corner of the cage I just haven’t used well so may stick a parrot toy, nesting box or hammock in to fill the space. Throughout it all I try and allow at least 20cm between items to make sure there’s space for them to move around. 8, Add Rats! – At this point I put the rats back in and settle back to watch the chaos (when I should be tidying up the bomb site my rat room has become). This is particularly important when I have rats new to my kind of set up, or older rats that are struggling to get around. By watching them I can see them figure out how to get from A to B and make sure they can reach most places without too much difficulty (I want them to push themselves but not be put off). Generally all my rats will try and get everywhere within the first 10 minutes of being in a new cage set up, as they get that excited. I give it a little while then go an patch up the mistakes that I’ve inevitably made, maybe a jump that’s a bit to wobbly, or a branch they manage to dislodge, or a space that they can’t really use. 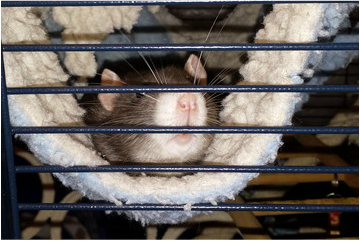 ​I will say that this is all a lot easier with a limited number of rats and groups, I typically spend a couple of hours faffing around with my cage, though as it’s not very heavily populated and doesn't have shelves I can leave a full clean out for every 3 weeks. 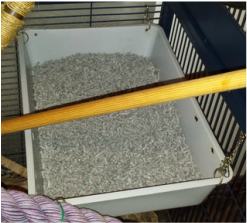 If needed though I can get a cage set up and cleaned out in 30 mins or so even with a SRS. With a bit of practice and smaller cages this could probably be made faster. I have also come across a useful approach for someone with multiple similar sized groups and cages/hutches. 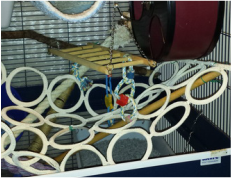 This involved keeping a certain amount of fixed set up and alternating the rats from one cage to another every clean out, an easier way to get lots of variety into an environment with more groups of rats and minimising your set up time.